For 21 years, Byte Back has been helping people who feel left behind in the computer age. The organization teaches people step-by-step how to use computers and understand them. Denise Johnson was homeless seven years ago. “I had to meet certain requirements to continue getting my benefits, and that’s what ended up putting me here at Byte Back,” she said. What she learned changed her life. The same goes for Bernadine Ramsey. “The way they’ve taught, the way they’ve held my hand through this whole experience, through resume preparation to my classes,” she said. “We believe that everyone should have enough tech skills to fully participate in society,” Executive Director Elizabeth Lindsey said. 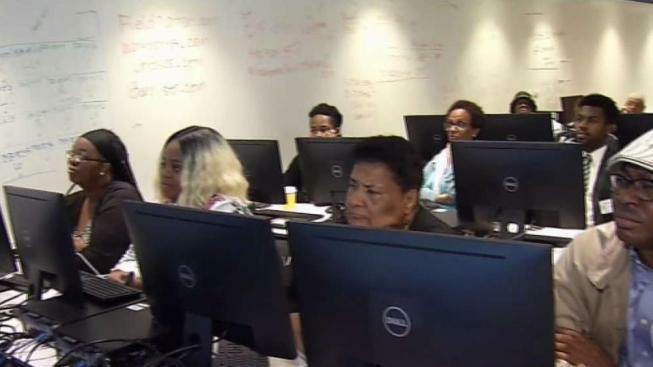 They offer free classes covering everything from learning how to send an email to eventually fixing software programs. Every lesson happens in person. “I have to be in a classroom, present, focused, with an actual teacher in front of me to help me to move forward,” Ramsey said. That investment pays off for the students. “On average, when our students graduate and move into a job, they’re making $24,000 a year more than they were before they were coming to Byte Back,” Lindsey said. Byte Back has had many success stories. “We had a student last year who was living in a storage unit and would be here at our doors at 7 a.m. because he couldn’t be in the storage unit and now he’s working in IT,” Lindsey said. Ramsey is proud of the example she’s setting for her daughter. “I can see the proud look that she gives me when she knows that I’m moving forward and doing something better for her and myself,” she said. Byte Back just won a $1 million grant that will allow them to begin offering classes in Baltimore next year.